So, if the point is not to deny warming altogether, what is the point in discussions of Climategate of picking over and trying to audit historical temperature records like the Hadley CRUT3 or NASA's GISStemp? Skeptics often argue that much of the warming is due to bogus manual adjustments in the temperature records and biases such as urban warming. Alarmists argue that the metrics may understate warming because of masking by manmade anthropogenic cooling agents (e.g. sulfate aerosols). Why bother? Why does it matter if past warming is 0.6C or 0.8C or 0.3C? There are at least two reasons. 1. The slope of recent temperature increases is used as evidence for the anthropogenic theory. We know greenhouse gasses like CO2 have a warming effect in the lab. And we know that overall they warm planets because otherwise ours would be colder. But how much does an incremental amount of CO2 (a relatively weak greenhouse gas) warm the Earth? A lot or a little? Is the sensitivity of the climate to CO2 high or low? Every time I try to express this, it sounds so ridiculous that people think I must have it wrong. But the main argument supporting a high climate sensitivity to CO2 is that scientists claim to have looked at past warming, particularly from 1950-2000, and they can't think of any natural cause that could behind it, which leaves CO2 by process of elimination. Yeah, I know this seems crazy - one wants to ask if this is really a test for CO2 sensitivity or of scientists' understanding and imagination, but there you have it. Now, they don't always say it this directly. What they actually say is that they ran their climate models and their climate models could not produce the warming from 1950-2000 with natural forcings alone, but could reproduce this warming with forcings from CO2. But since the climate models are not handed down from the gods, but programmed by the scientists themselves to represent their own understanding of the climate system, in effect this is just a different way of saying what I said in the previous paragraph. The climate models perform the function of scientific money laundering, taking an imperfect knowledge on the front end and somehow converting that into settled science at the output. Now, there are a lot of ways to criticize this approach. The models tend to leave out multi-decadal ocean cycles and don't really understand cloud formation well. Further, the period from 1957-2008, which supposedly can only be explained by non-natural forcings, has almost the exact same temperature profile and increase as the time from 1895-1946, which of necessity must be mostly "natural." I go into this more here, among other places. This is the sort of unified field theory of everything we are seeing in the CRU emails. We see scientists using every trick they can find to lower or smooth out temperatures numbers before 1950, and adjust numbers after 1950 upwards. Every single trick and programming adjustment all tended to have this effect, whether it be in proxy studies or in the instrumental record. And all the efforts to prevent scrutiny, ignore FOIA's, and throw out raw data have been to avoid third party replication of the statistical methods and adjustments they used to achieve these ends. 2. It is already really hard to justify the huge sensitivities in alarmist forecasts based on past warming -- if past warming is lower, forecasts look even more absurd. The blue line corresponds to the IPCC no-feedback formula that I think originally goes back to Michael Mann, and yields about 1-1.2C of warming for greenhouse gas warming from CO2 before feedback effects. The middle two lines correspond to the IPCC mid and high forecasts, and the top line corresponds to more alarmist forecasts from folks like Joe Romm who predict as much as 8-10C of warming by 2100 (when we will be at 650-800ppm CO2 per the IPCC). By the way, the IPCC does not publish the lines above the blue line, so I have taken the formula they give for the blue line and scaled it to meet their end points. I think this is reasonable. A couple of things - all climate models assume net positive feedback, what skeptics consider the key flaw in catastrophic global warming theory. 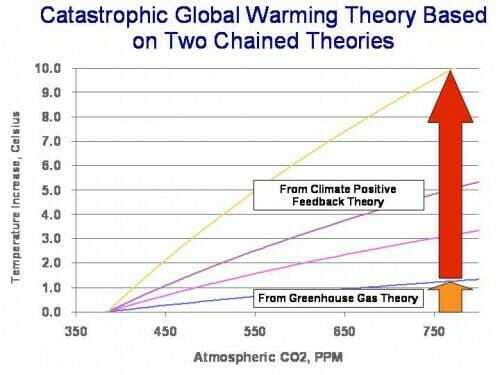 In fact, most of the catastrophe comes not from global warming theory, but by this second theory that the Earth's temperature system is dominated by very high positive feedback. I illustrate this here. The blue line is from CO2 greenhouse gas warming. Everything above it is from the multiplier effects of assumed feedbacks. I won't go into the feedback issue much now - search my site for positive feedback or else watch my video for much more. 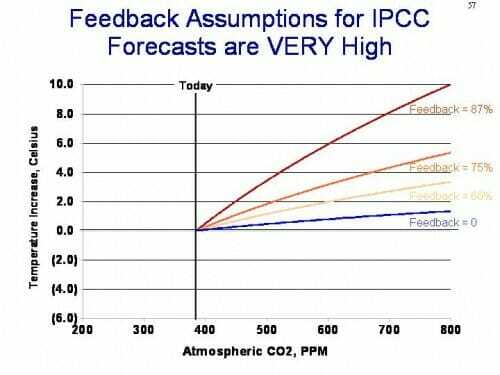 Suffice it to say that skeptics consider the feedback issue the key failure point in catastrophic forecasts. Anyway, beyond arguing about feedbacks, there is another way to test these forecasts. Relationships that hold for CO2 and warming in the future must hold in the past (same Earth). So lets just project these lines backwards to the CO2 level in the late 19th century. Can you see the issue? When projected back to pre-industrial CO2 levels, these future forecasts imply that we should have seen 2,3,4 or more degrees of warming over the last century, and even the flawed surface temperature records we are discussing with a number of upwards biases and questionable adjustments only shows about 0.6C. Sure, there are some time delay issues, probably 10-15 years, as well as some potential anthropogenic cooling from aerosols, but none of this closes these tremendous gaps. Even with an exaggerated temperature history, only the no feedback 1C per century case is really validated by history. 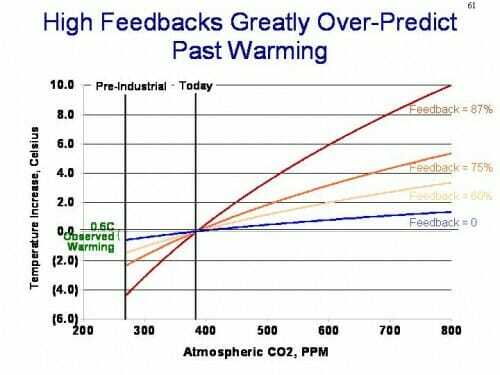 And, if one assumes the actual warming is less than 0.6C, and only a part of that is from anthropogenic CO2, then the actual warming forecast justified is one of negative feedback, showing less than 1C per century warming from manmade CO2 -- which is EXACTLY the case that most skeptics make. (1) More than once I have contemplated how much the fact that the invention of the thermometer occurred at perhaps the coldest point in human memory (early 17th century) has contributed to the perceptions of current warm weather being unusual. (2) For those who are on the ball, perhaps you can spot an amazing disconnect here. Scientists claim that the natural variation of temperatures is in a very narrow band, that they never move even 0.2C per decade by natural means. But they also say that the Earth's temperature system is dominated by positive feedback, meaning that very very small changes in forcings are magnified many fold in to large temperature changes. I won't go in to it in depth from a systems perspective, but trust me that "high stability in a narrow range" and "dominated by high positive feedback" are not very compatible descriptions of a system. The video from my climate lecture on November 10, 2009 is now available online. I have overlaid the slides on the video so you can see them better. If I have time, I may some day re-record the sound track over the slides in a studio setting. The HD video is available full length via Vimeo embedded below. This is a lower resolution version -- to see it in its full high-resolution glory click here. This higher resolution version is greatly recommended - the Vimeo engine works well and I find it streams even better than low-resolution YouTube videos on most computers. Catastrophe Denied: A Critique of Catastrophic Man-Made Global Warming Theory from Warren Meyer on Vimeo. You can also view it on YouTube, though by YouTube's rules the resolution gets crushed and it has to be broken up into nine (9!) parts. The YouTube playlist is embedded below or is here. The slides from this presentation can be downloaded here. Reilly and Herrgesell, the company's president and project manager, respectively, have been trying to develop a way to "incentivize the consumer" for nearly two years. What they came up with was a model for selling personal carbon credits. "(It's) a new idea," said Herrgesell, "but a very powerful idea." To get started, you create a personal profile with usage data from your utility bills over the last year at My Emissions Exchange. Then, you reduce your energy consumption. My Emissions Exchange certifies your personal carbon credits, and sells them for you in the global voluntary carbon market. The carbon credits are equal to a one-ton reduction in carbon emission, and are currently trading between $10 and $25, according to the site. "This is the only effort out there that can align green activity with financial benefit," said Reilly. First, I have looked at the site in question, and find no differentiation for how one's power is generated. My power in Phoenix comes from a big honking non-CO2-emitting nuclear plant, so my actual carbon credits for reduction in electricity use are theoretically more complex. Is the clean nuclear power I didn't used sold so it substitutes for fossil fuel power? Did I cut my power peak or off-peak? And does it substitute for gas (not much CO2) or coal ( a lot of CO2)? Its amazing that there are real markets that will accept such soft savings as real credits to be paid for. Second, in the proposed Waxman-Markey bill, utilities get counted directly on their CO2 output, so either this program will have to go away or else it will represent a double counting of the same benefit (as at the utility level your reduction in electricity use will also "count"). Third, the economic knowledge of the author quoted above is just staggeringly low. I mean, all this time I thought electricity prices were how consumers were "incentivized" [sic] to use less power. The implication is that somehow incentives are out of alignment and this is the "only effort" aimed at aligning them. But consumers already save money by reducing their utility use (does anyone have a utility contract that reads the opposite?) One might argue that these guys can provide an additional financial incentive that will create incentives for more conservation at the margin, but that's about it. The problem isn't the color per se, but the reflectivity of the paint overall. And dark colors just don't reflect well, so they are likely out. "Jet black remains an issue," says the report. Anyone who's ever entered a very hot car knows that it can be cooled down immediately by driving a few feet with the windows open, effectively neutralizing any color-caused heat issues before engaging the air conditioner. But whatever, black is evil. Un-freaking-believable. This is what happens when you satisfy an emissions reduction goal (in this case CO2) via complex command-and-control legislation rather than simpler price mechanisms. Earlier, I told the story of how California adopted an increasingly sprawling CARB micro-management of their economy to reduce CO2 rather than implementing earlier proposals for a simple carbon tax. I ran into a friend at the corner drugstore the other day. This friend happens to have both beautiful looks and powerful progressive politics. She was standing in the cosmetics aisle looking bewildered. Which products might be best for the planet and healthiest for her face? What would be the worst-possible green product, from a financial perspective? I finally settled on this one: Low carbon handgun ammunition, for the progressive Bay Area resident who is worried that her concealed carry Glock 9 is creating too many greenhouse gasses down at the firing range. Postscript: Because I almost never post much on gun topics, I will take the opportunity to plug my friend's new product, a barrel stabilizer for a Ruger mini-14. It looks great, it works, and it is about half the price of other solutions. His web site for the Mo-rod mini-15 barrel stabilizer is here. I don't think younger folks really comprehend the staggering environmental improvements we have made over the last 40 years. Virtually every metric you can think of on air and water pollution has improved, not to mention the return to health of a number of high-profile species like the bald eagle. So I am sure that had you told me in the early seventies that the main toxic threats that the government would be campaigning to protect us from in 2009 were carbon dioxide and salt, I would have thought you were crazy. I have written enough on how much superior carbon taxes are to cap-and-trade as a CO2 reduction methodology (if we really are going to do "something," which I hope we don't). An index of these articles is here. In the title, I say "another" reason, becuase the number one reason we won't see a carbon tax is that politicians greatly prefer an indirect tax over a direct one, even if it is far more inefficient. This was explained directly and clearly to me by the author of California's cap-and-trade program. Close behind this, in second place, is the fact that cap-and-trade spawns a dizzying array of lobbying and special interest influence possibilities that carbon taxes do not, and all those lobbyists mean more power and campaign contributions for politicians. But here is another reason why it will never happen: Too many very influential Democrats have substantial investments in start-up companies whose entire existance depends on living in the cracks of cap-and-trade, particularly in generating various dubious offset schemes. Al Gore is the most obvious example, but apparently Obama's new climate czar Carol Browner sits on boards of such companies as well.